Box.net is user friendly and makes uploading and sharing files easy. 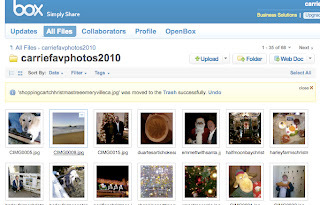 Photos can be viewed either in a gallery format as pictured here, or icon format. I'm looking forward to the drag and drop technology for folder uploads to be ready for the Mac, as only the PC version is available now. Click on individual files, and you have a choice of moving to another folder, editing photos, sharing links via emal and social media, and other options. Entire folders can be shared as well. Have you been organizing your computer files for the new year? Over the last few days, I've been busy making new computer folders for 2011, which of course begs the question -- what to do with the old ones? Since storage space is at a premium, and I have a slightly older Mac that I need to keep clear of extraneous files and applications, the older files need to be stored. Last year, after much research, I bought a perfectly fine Lacie Hard Drive, which I happily use to back-up files every 2 weeks or so. But I also realize that Lacie (that's what I call her), could theoretically get damaged if I ever movde her around or transported her from her perch atop my desk. So that led me to some cloud-based solutions. I'm happy to report that after a few days of research, some of which extended into the wee hours as I became increasingly obsessed with icons, folders, things like "magic suitcases," and other more mundane terms like "parent files," I have found a few really good programs that fit the bill. Right now, I'm experimenting with 3 in particular and using them all as backup and storage needs come up, so I can assess after a month or so which one I'll finally choose. For now, here's my review of 3 finalists. I'm posting the first one today, and finalist #2 on Friday, and #3 on Saturday, so stay tuned! 1. Box.net: I first discovered Boxnet about a year ago, when I needed to find online photo storage that had good social media and e-mail sharing features. I also needed to easily send photo links to my parents. I had been using Kodak Easyshare for a few years, but they had recently changed their interface to a flash platform that slowed down my computer and was too flowery for what I needed. Box.net has made a lot of great enhancements over the year, including a Linked In application that allows users to link folders from Box.net to their Linked In profiles. I used it a few months ago to highlight some of my publications and recent photos, and it was fast and easy to use. Box.net, has generous storage, and several premiums upgrades you can research depending on your needs, starting at $10 a month. While the file upload in the free account is a bit slow, it works fine for smaller numbers of files. Last night, it took me about 20 minutes to upload 50 photos. Viewing options allow the user to publish and send links to individual files and folders, edit photos, move files between folders, and integrates collaboration between multiple users. I also like how you can create a website and share the URL link, so that others can easily view your site as well. Box.net also has a Facebook application so you easily post and share there as well. The only con I see now with the program is that there is as of now no drag and drop file management feature for the Mac. I asked about this on Boxnet's Facebook page, and received a prompt response from a rep that they were still working on the Mac version. I also suggested they create a slideshow feature for viewing, which they are now going to consider. Yay. Stay tuned on Wednesday and Saturday for Finalists #2 and #3 in the Cloud Storage Solutions Series, and here's a secret...there's a prize at the end! In the meantime, feel free to post your comments here on any great solutions for file backup and storage that you've discovered lately.